Introduction: Tattoos are a vastly popular form of body modification. However, there are no government regulations in regards to tattoo ink compositions. In this paper we report a case of chronic ulceration secondary to tattoo. 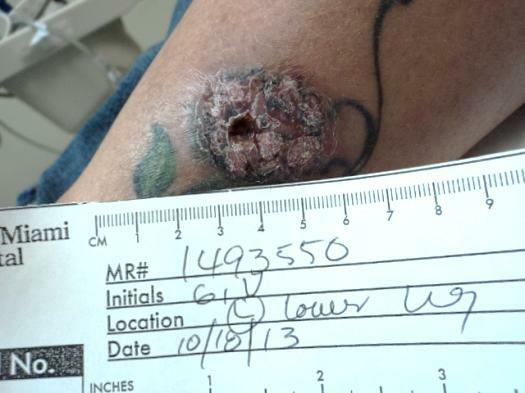 Case presentation: A 42-year-old female presented with a history of a non healing ulcer on her leg over a recent tattoo. Surgical excision of ulcerated area as well as negative pressure vacuum therapy and weekly wound care visits were performed and patient was fully healed by her 16 week follow up. Conclusion: The composition of commonly used Tattoo ink can cause ulcerative lesions. Since the word tattoo was introduced to the Western Hemisphere by explorer James Cook, it has gained widespread popularity through all social classes including the likes of Winston Churchill himself. However, increases in popularity also come with increases in documented complications such as allergic, granulomatous and lichenoid reactions . We present a rare case of a non-healing ulceration and allergic reaction caused by a tattoo. 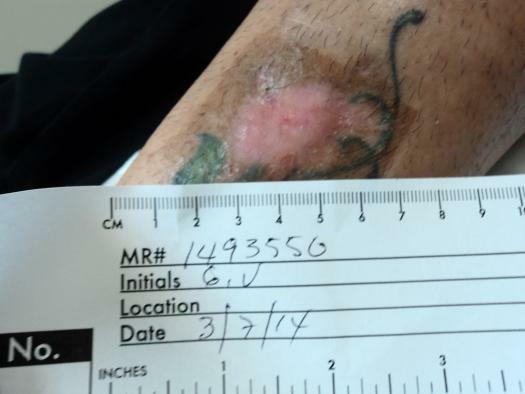 A 42 year-old female presented to our wound care center with complaints of a six-month history of a non-healing ulceration to her lateral left ankle. The patient stated that one-year prior she received a tattoo to her left ankle while vacationing in Cuba. The tattoo initially healed with no issues. At 6 months after the initial tattoo application the patient noticed a raised area where red ink had been placed, which eventually ulcerated. The patient attempted to treat the area with topical over-the-counter cortisone creams and triple antibiotic ointment, with no improvement. The patient complained of mild discomfort and pruritus to the area but there was no noteworthy pain. The patient had no significant past medical history and no known drug allergies. The patient was not currently taking any medications at home. Physical examination revealed full thickness ulceration to the lateral aspect of the ankle. The ulceration measured 0.6cm x 0.6cm x 0.3 cm. The wound base was a mixture of fifty percent granular and fifty percent fibrotic tissue. The periwound area had a raised verrucous appearance in a 2cm diameter with xerosis and erythema. There was no noted drainage or purulence (Figure 1). Patient had strong pedal pulses bilaterally. Varicose veins were noted as well as corona phlebectatica. A punch biopsy was performed at the initial visit. The pathology report revealed acanthotic and parakeratotic epidermis with surface suppurative inflammation and superficial dermal mixed acute and chronic inflammation, hypocellular and partially necrotic dermal collagen and pigment in the dermis. Figure 1 Initial wound presentation. Post excision pathology report showed skin ulceration with acute and chronic inflammation, focal abscess formation and collections of histiocytes. There were no organisms found on AFB or PAS stains. Surgical cultures revealed heavy growth of Methicillin-Resistant Staphylococcus Aureus. An infectious disease consultation was obtained and the patient was treated with IV vancomycin while inpatient and oral trimethoprim/Sulfa at discharge for ten days . We continued use of negative pressure wound VAC therapy (KCI wound VAC) and weekly sharp debridement. Wound VAC therapy was discontinued at 7 weeks. Weekly debridement of any fibrotic tissue and the use of multi-layer compressive dressings were continued. The patient was completely healed at their 16-week follow up and was discharged from our care at that time (Figure 2). Figure 2 Final appearance of healed wound. The growing popularity of tattoos has lead to an increase in the rate of complications associated with tattoo application. A review of the literature depicts complications of tattooing as early as 1952 where Lubek et al documented four separate pathologic consequences of tattooing, namely Boeck’s sarcoid, secondary syphilis, discoid lupus and a mercury sensitivity reaction. Currently, the FDA has no approved tattoo inks and do not regulate their composition . In April of 2014 the FDA launched a “think before you ink” campaign warning consumers of substantial risks including infection, allergies, scarring, granulomas and MRI complications . Tattoo inks include different pigments ranging from inorganic metallic salts, organic molecules and organic dyes. Kluger et al reported known allergenic metals, nickel, cobalt, chromium and mercury, found in tattoo inks. While there are documented complications from all tattoo pigments, hypersensitivity reactions to red pigments are the most common [3,5]. Particularly reactions to red pigments containing cinnabar, which is composed of mercuric sulfide. Reactions to red pigment have been associated with allergic contact dermatitis, lichenoid dermatitis, pseudolymphomatous and sarcoid reactions . Hypersensitivity reactions and complications are not isolated to the lower extremity. There have been a number of documented cases of adverse reactions to tattoos involving all areas of the body . Tattooing has the potential to spread infectious diseases, namely hepatitis, chanchroid, MRSA and atypical mycobacterial diseases, among others and lowers the ability to fight infections in the tattooed area [2,6]. The process of tattooing in itself induces a chronic inflammatory response that can be seen years later . Currently there are no set standards in the treatment of tattoo related reactions. Tattoo related reactions have variable presentation and the treatment and management of these dermatologic inflammatory reactions are based on the presenting pathology with the use of biopsy and cultures [7,8]. Tattoo related ulceration appears to be uncommon with only a few cases documented in the literature [4,7,8]. Our case presents the rare occurrence of tattoo-associated ulceration while also highlighting a novel method of management that ultimately led to wound healing. Moving forward it is critical to stress the importance of patient awareness of the risks associated with tattooing. Though these risks may appear minimal, they can be disfiguring and lead to the introduction of deadly infectious agents. Tattooing has been around for centuries and its popularity is unlikely to decrease, so timely recognition of adverse reactions to tattooing such as allergic reaction, granulomatous and ulcerating reactions should be reported and managed promptly to ensure optimal patient outcomes. 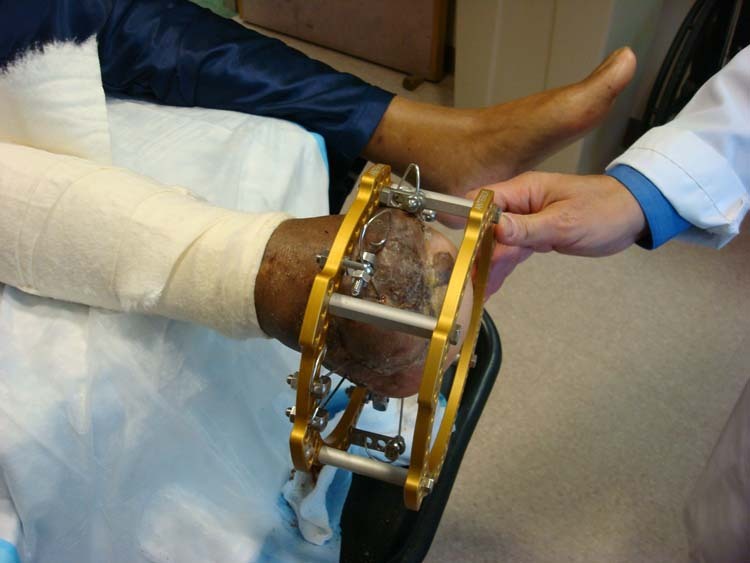 External fixation was used almost exclusively for fracture management. It is also used for arthrodesis, management of lower extremity deformities such as Charcot neuroarthropathy, limb lengthening, osteotomy stabilization, osteomyelitis, nonunion or pseudoarthrosis. It has proven extremely useful in the treatment of a number of conditions because it can provide distraction, compression, stabilization and neutralization as needed. Traditional external fixators involve driving pins through the tibia and fibula. The VCAM™ is a unique below the ankle external fixator. The VCAM™ can avoid possible disruptions and complications that are often seen with traditional Ilizarov fixators. The indications for the VCAM™ external fixator are identical to the Ilizarov fixators, such as off-loading, fracture reduction and reconstructive procedures. In our institution, we have used the VCAM™ device to off-load ulcerations and correct limb deformities. 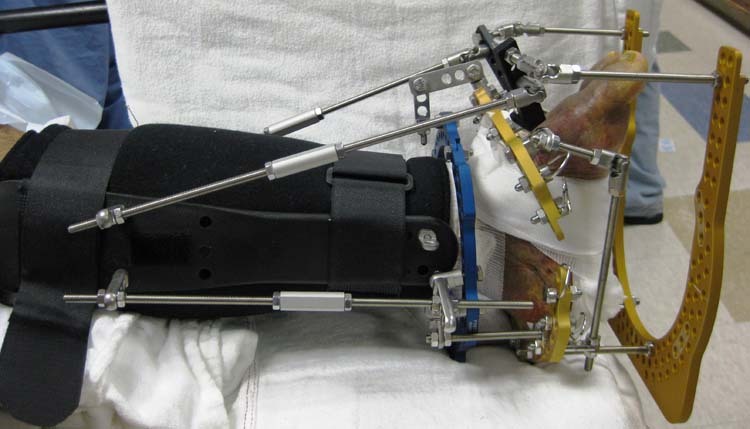 In the cases presented in this paper the VCAM™ was used to off-load wounds secondary to Charcot arthropathy and transmetatarsal amputations, as well as to gradually correct a rearfoot deformity such as seen in a Chopart’s amputation. The VCAM™ can be constructed into an Ilizarov type frame or a hybrid frame which can be used to achieve gradual triplanar correction. We have seen good results using the VCAM™ for wound care and limb deformities and recommend this approach when tibia and fibula intervention is not necessary. Key words: Limb deformity, Charcot foot, ulceration, VCAM™, wound, external fixation. External fixators have proven very versatile in treatment as they can be used with open, closed or limited open surgical techniques. They provide access to the involved limb for wound healing and dressing changes and can be designed to correct complex deformities such as Charcot joint. They allow for gradual, precise correction over the postoperative course rather than a single intra-operative correction by osteotomy or fusion. There is limited mention in the literature of external fixation devices that do not extend proximal to the ankle. The purpose of this paper is to introduce the VCAM™ external fixator and present its various uses and construct designs. The VCAM™ has been available for nearly a decade. In our opinion it is an underutilized external fixator because it has not been previously reported in the literature which has lead to an ignorance of the device in the orthopaedic community. When all ancillary pedal procedures are complete and the half rings and wires have been applied to the operative site and tensioned, the VCAM™ leg sleeve is first applied over cast-padding. Next, the plastic extensions are attached by velcro and are secured. Then three or four hole posts are secured to the plastic extensions to which various sized rods are attached spanning from the leg down to the foot. These rods are connected to the foot plate and half rings with the use of posts, if needed. 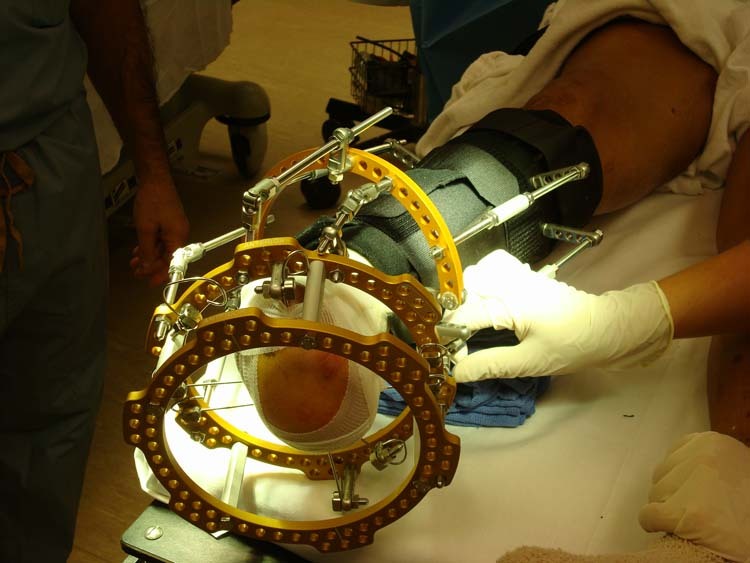 Note that the foot plates and half rings are secured in place with nuts and bolts to the smooth olive transfixation wires during the surgical reconstruction. Lastly, the rubber rockerbottom foot attachment allows protection and partial weight bearing. Constructs are designed based on the pedal pathology present. Once there is clinical and radiographic evidence of consolidation at the fusion site, or there is clinical correction of a specific limb deformity the external fixator may be removed. 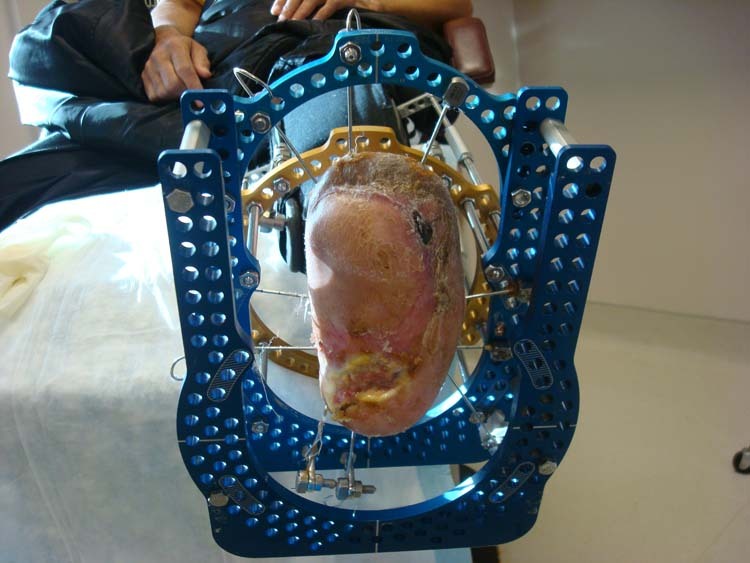 The frame is often removed after 8 to 12 weeks and the patient is fitted for a Charcot Restraint Orthotic Walker (CROW) and remains in this device for 6 months. Thereafter, patients are fitted for ankle foot orthoses (AFO) and custom extra depth shoes with appropriate fillers if necessary. He had the VCAM™ external fixator applied to offload the ulcer and to gradually correct the adducto-varus deformity. The pins were placed distally through the amputation site to create a more stable frame. He had an adjunctive Achilles tenotomy. Weekly adjustments consisted of tightening the lateral aspect of the frame and loosening the medial components to bring the foot perpendicular to the leg. (Figs. 2A, 2B and 2C) After six weeks of weekly adjustments clinical correction of the deformity was achieved and the lateral ulcer healed. The VCAM™ was then removed. (Figs. 3A and 3B) He was then placed in a CROW Walker to weight bear. Even though the VCAM™ is primarily a below ankle frame it can be designed to imitate a Taylor Spatial™ external fixator, as it was for this case. A half ring was able to be applied above the ankle without any pins inserted into the leg and six struts were fashioned to help achieve gradual triplanar correction of the lower extremity deformity. 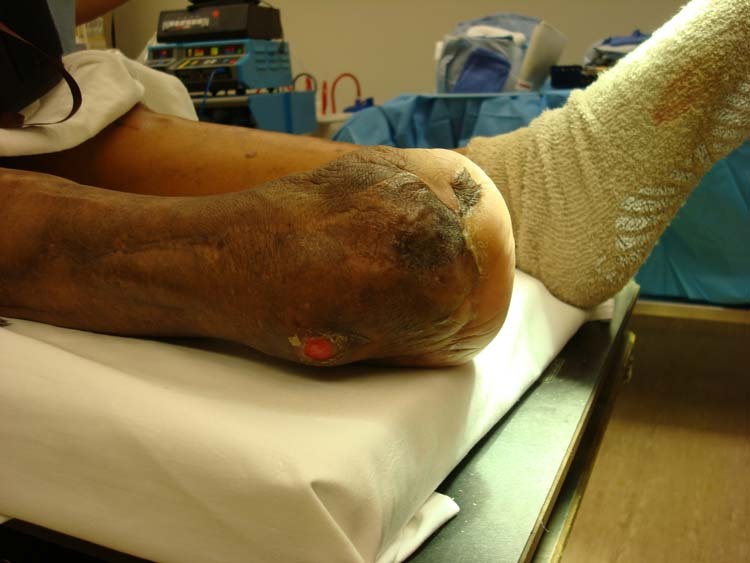 A 60 year-old male with history of Diabetes Mellitus with peripheral neuropathy and ESRD, presented to wound care center with a chief complaint of chronic non-healing plantar ulcers of six months duration. The patient had a previous left foot trans-metatarsal amputation (TMA) with an ulcer on the distal plantar lateral aspect of the TMA site and a plantar heel ulcer. Local wound care with weekly debridements failed to heal the ulcers. The plantar heel ulcer measured 5cm x 6cm and probed to bone. It was then decided to proceed with surgical debridement of the ulcer and VCAM™ application. On March 3rd, 2008 a percutaneous tendo-Achilles lengthening (TAL) and tenotomy of the anterior tibial tendon were performed to relieve forefoot pressure on the distal plantar lateral TMA site ulcer. The Versajet Hydrosurgery System™ (Smith & Nephew) was used to debride the plantar ulcers of all necrotic tissue and then application of Apligraf® (Organogenesis) skin substitute was applied to the heel ulcer. At this point, a VCAM™ external fixator was applied to offload the plantar ulcerations and help maintain angular correction after TAL and anterior tibialis tenotomy. The pins for the frame were thrown distally through the TMA site exiting posterior to the heel to help create a more stable construct. The VCAM™ in this case is a standard Ilizarov type frame and was primarily used to offload the ulcers. (Fig. 4A and 4B) The ulcers were progressing well and had decreased in size significantly until the patient tripped and fell while ambulating which ultimately led to several pin tract infections. (Figs. 5A and 5B) The causative organism of the pin site infections was MRSA. 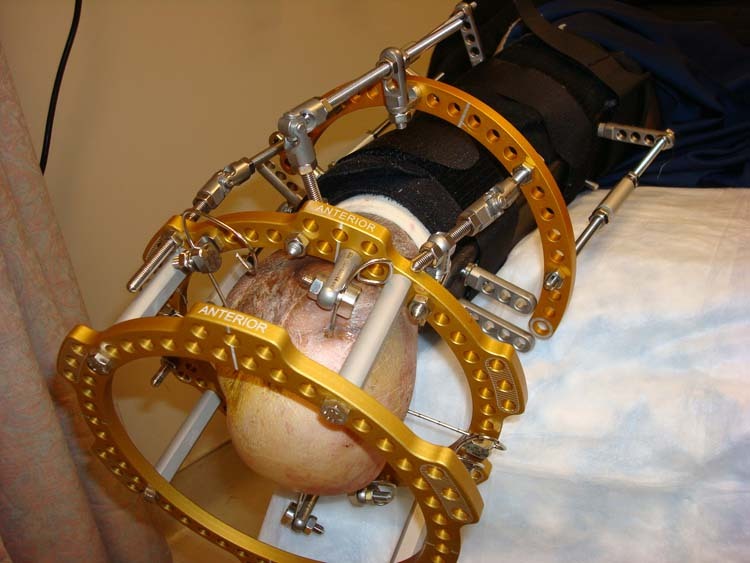 The patient was started on Zyvox® (Pfizer) and the VCAM™ fixator was removed on April 17, 2008. Figure 5A and 5B Case 2: 2weeks after VCAM™ application showing ulcer healing with associated pin tract infections. (A) 4 weeks after VCAM™ application with progressive closure of the ulcers. The distal plantar ulcer healed before the fixator was removed and all wounds healed with continued off-loading after removal. Pin site infections are the most common complication with external fixators. In this case, patient selection was appropriate. He could ambulate without any significant issues prior to VCAM™ application that would deter a foot and ankle surgeon from applying an external fixator. In our opinion the result of the patient falling was accidental. 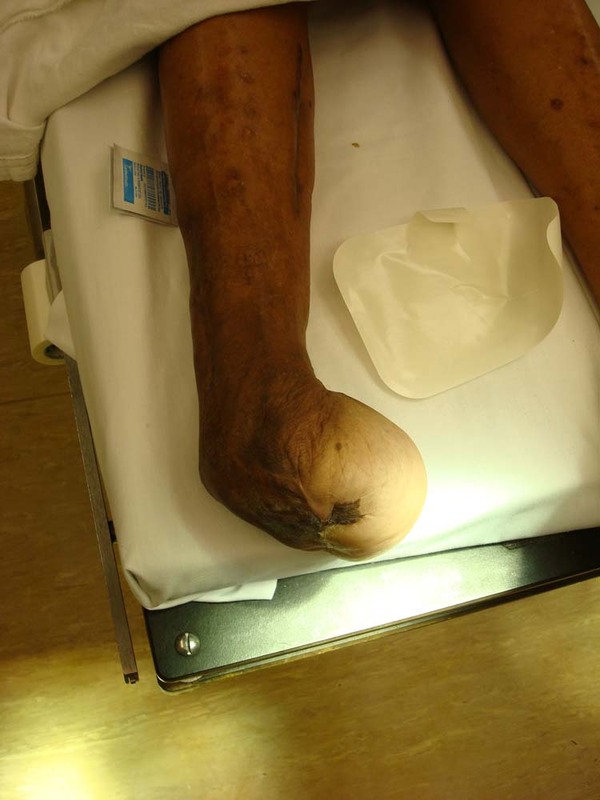 A 51 year-old diabetic female with history of Hypertension, Hypercholesterolemia, Charcot Neuroarthropathy and a non-healing Wagner Grade 3 ulcer measuring 2.4 cm x 2.5 cm x 2.4 cm present for more than 1 year duration, was seen in the Wound Care Center. (Figs. 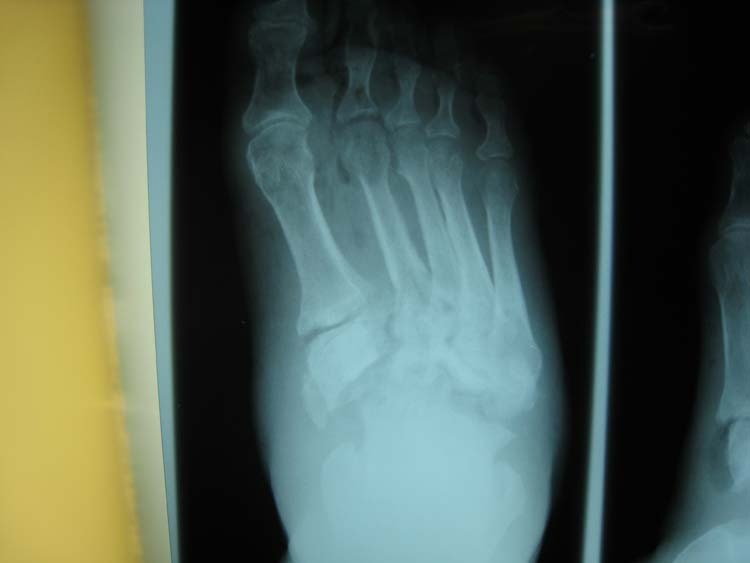 6A and 6B) Radiographs revealed a Charcot foot deformity with dislocation at the LisFranc and Chopart joints. (Figs. 7A and 7B) After 17 hyperbaric oxygen treatments helped to resolve cyanosis of the digits, it was decided that surgical intervention would be necessary to realign the midfoot and to offload the ulcer. There is limited mention in the literature of external fixation devices that do not extend proximal to the ankle. Herbst uses two types of external fixation devices for the treatment of Charcot Arthropathy. One is a foot frame and the other a tibiocalcaneal frame. He uses the foot frame for the correction of midfoot deformity. The main characteristics are a hindfoot ring and a forefoot ring in the coronal plane. The two rings have a spanning device between them to provide compression across the midfoot. Malizos, et al., described an Ilizarov below the ankle circular frame to treat displaced calcaneal fractures. There are 2 rings both confined to the foot. The proximal ring serves a stable ground through the talus and midfoot bones and supports the distal ring. The 2 rings are distracted to withstand the deforming forces of the Achilles tendon, the plantar musculature, aponeurosis and peroneal retinaculum. Ligamentotaxis can be used for reduction of fragments. Reduction of the shape and height of the calcaneus is easy with the use of gradual distraction. They concluded that rings attached to the distal tibia are not necessary. 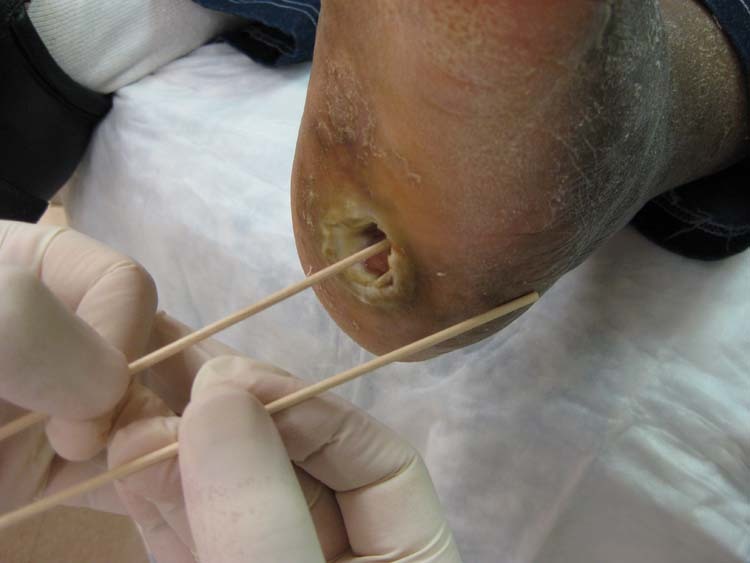 Possible complications associated with the external fixator include: uncontrollable edema with drainage exiting at the pin tract sites, pin tract infections, pin loosening, pin irritation, pin/wire breakage, thermal necrosis, non-union, delayed union, malunion, osteomyelitis, joint contractures/subluxation, wound dehiscence, compartment syndrome, reflex sympathetic dystrophy and fracture after frame removal. Many of these complications can be avoided with post-operative compliance and follow-up care. Edema can be alleviated by elevation and partial weight-bearing immediately post-op. Another potential complication is severe pain and damage due to pins or wires compromising muscles, tendons or neurovascular structures. In the cases presented it is evident that the VCAM™ can be constructed in many configurations and therefore be used to treat a variety of lower limb deformities that could lead to ulcerations. In the first case the VCAMTM was applied to achieve gradual correction of a triplanar deformity. It was successful in doing so without the use of leg pins or wires. In the second case it was used a traditional Ilizarov frame to simply offload the extremity to assist in healing two plantar ulcers. In the third case it was again constructed as an Ilizarov type frame to offload a plantar ulcer and to provide compression of the midfoot to the hindfoot. In all three of these cases the VCAM™ was successful and proved to be a useful device to heal ulcerations and correct deformities without the use of leg pins or wires. One of the disadvantages of the VCAM™ as seen in the second case was the development of pin tract infections. This is the most common disadvantage with any external fixator, but the absence of leg pins in our opinion decreases the chance of pin tract infections with the VCAM™. More case studies and research should be explored with the VCAM™ in the areas of trauma especially Lisfranc fractures since it is a midfoot deformity and other lower limb deformities. In conclusion we feel that the VCAM™ is an excellent modality when managing limb deformities that have lead to the development of ulcerations. It provides a means of realigning the foot in all necessary planes while simultaneously offloading ulcerations. The benefits greatly outweigh the risks associated with use of this device. We have seen good results using this device and recommend it for offloading ulcerations secondary to limb deformities. More case studies and research should be explored with the VCAM™ in the areas of trauma especially Lisfranc fractures since it is a midfoot deformity and other lower limb deformities. 1. Hamilton GA, Ford FA. 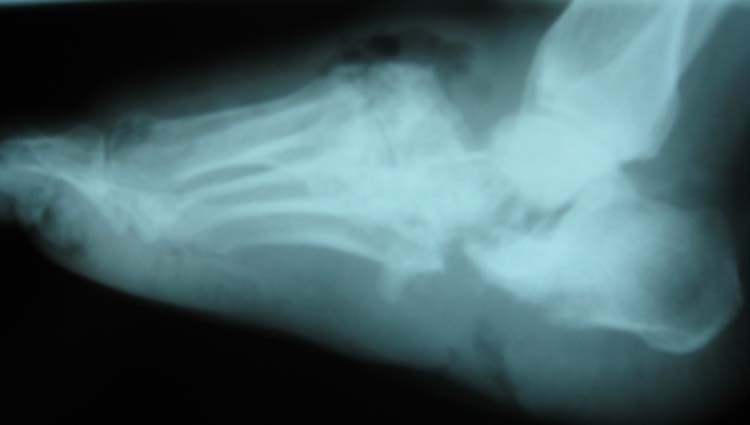 External fixation of the foot and ankle Elective indications and techniques for external fixation in the midfoot. Clin Podiatr Med Surg 2003 20:45-63. 2. Baker MJ, Offutt SM. External fixation Indications and patient selection. Clin Podiatr Med Surg 2003;20:9-26. 3. Vito GR, Talarico LM, Kanuck DM. 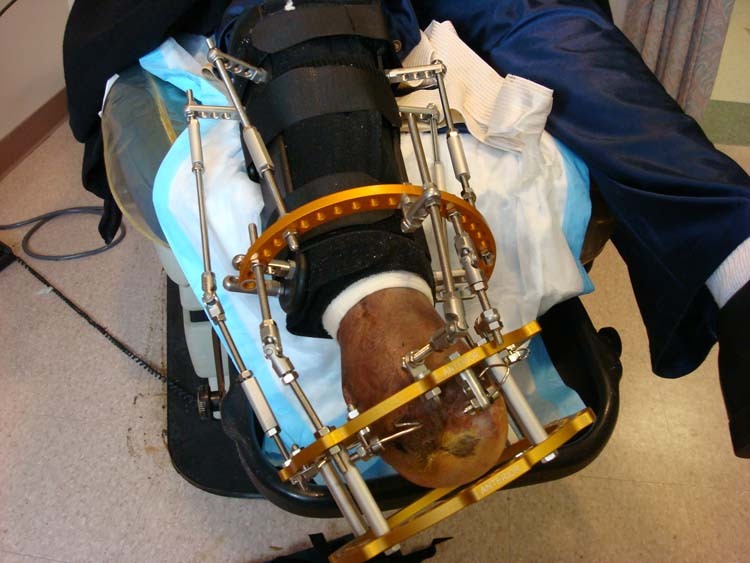 Use of external fixation to correct deformities of the lower leg. Clin Podiatr Med Surg 2003 20:119-157. 4. Cooper PS. 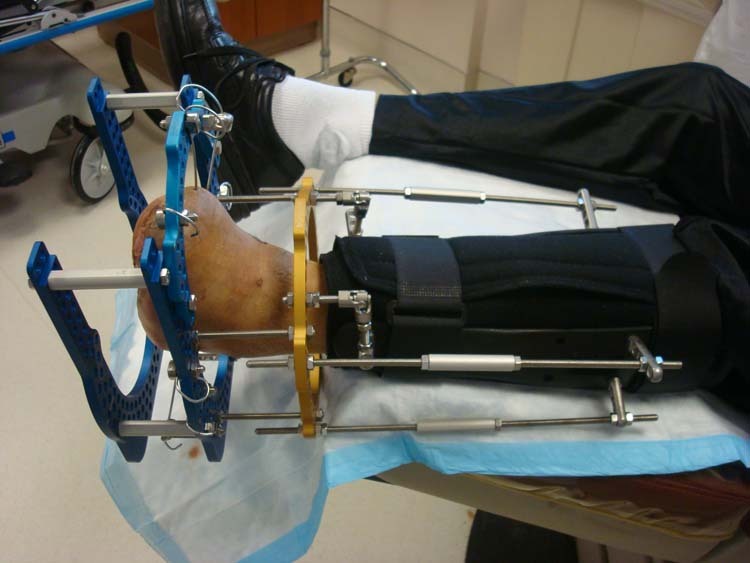 Application of external fixators for management of Charcot deformities of the foot and ankle. Foot Ankle Clin N Am 2002 7:207-254. 5. Cooper PS. 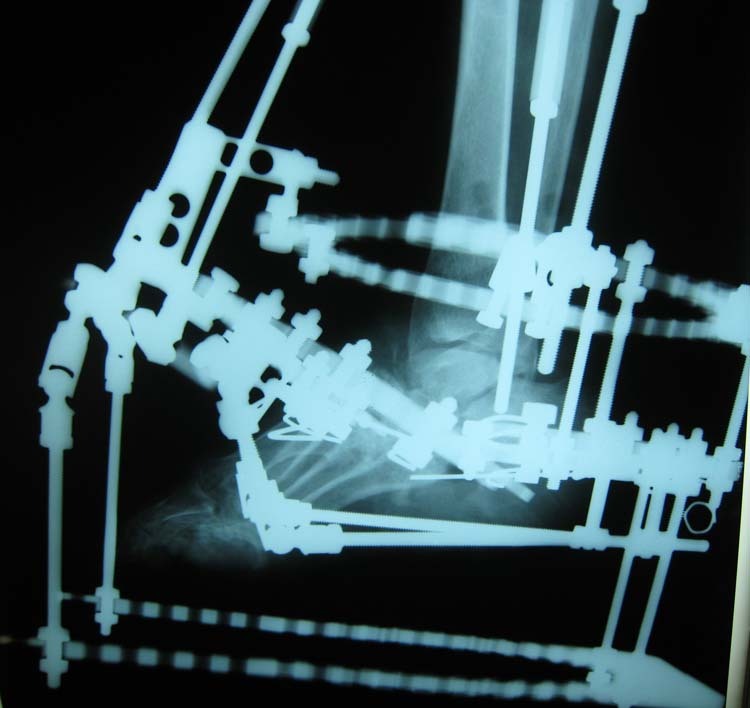 Application of external fixators for management of Charcot deformities of the foot and ankle. Semin Vasc Surg 2003 16: 67-78. 6. Jolly GP, Zgonis T, Polyzois V. External fixation in the Management of Charcot Neuroarthropathy. Clin Podiatr Med Surg 2003 20:741-756. 7. Herbst, S. External fixation of Charcot Arthropathy. Foot Ankle Clin N Am 2004 9:595-609. 8. 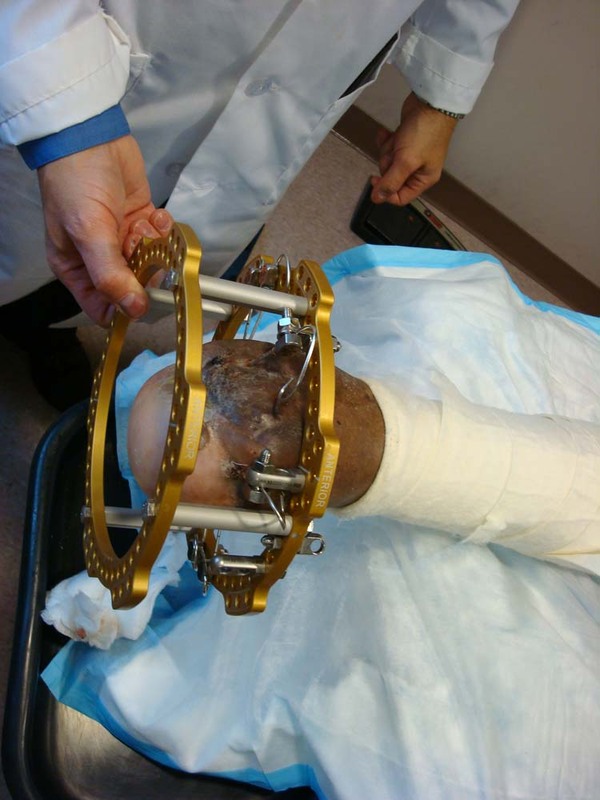 Malizos KN, Bargiotas K, Papatheodorou L, Dimitroulias A, Karachalios T. The below-the-ankle circular frame: A new technique for the treatment of displaced calcaneal fractures. J Foot and Ankle Surg 2005 45(5):295-299. 9. Bevilacqua NJ, Rogers LC. 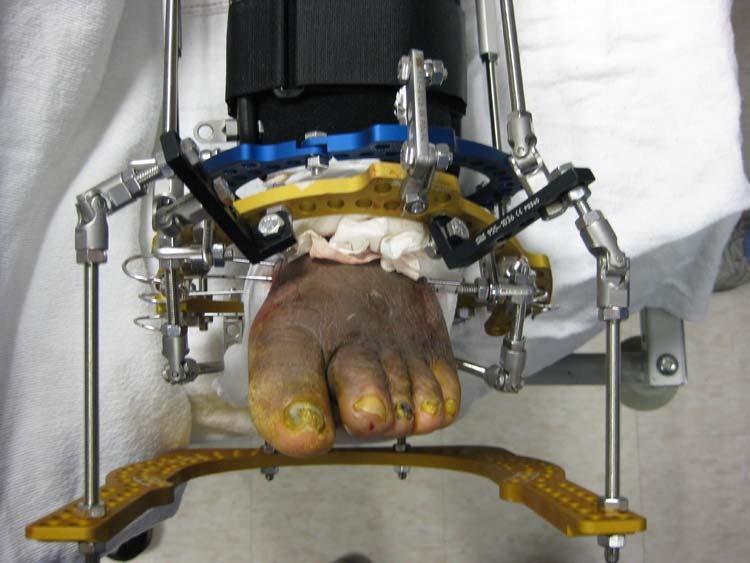 Surgical management of Charcot midfoot deformities. Clin Podiatr Med Surg 200825:81-94. 1 Director of Podiatric Medical and Surgery Program at NorthShore Forest Hills LIJ; 5901 69th street, Maspeth, NY 11378. 2 PM&S 36 Resident; Hahnemann University Hospital. 3 PM&S 36 Resident; Hahnemann University Hospital. 4 Private Practice New York, NY.